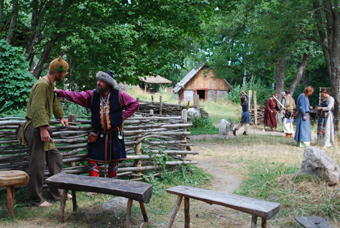 In 1996, two enthusiasts got the initiative to start a Viking village at the site where previously 199 Iron Age / Viking Age (800-1000 AD) burial mounds were discovered. 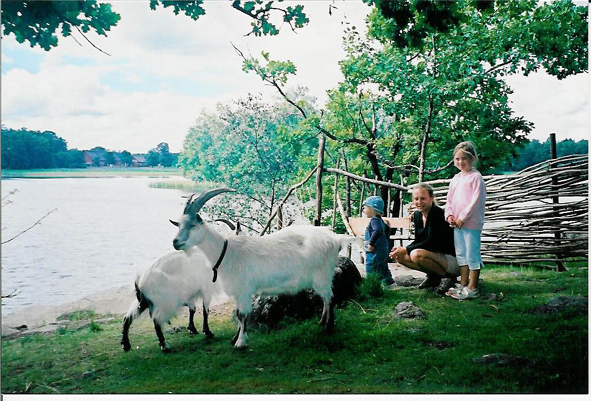 They soon started cooperation with two local association: the “Aquila Maritimus forn- och medeltidsförening” and the “Roslagens turistintressenter”. Then the foundation Stiftelsen Storholmen Norden was formed, that runs the village today. The purpose of Storholmen Norden is to give insight in the complexity of Viking society to visitors, to offer a broader view of Viking age than the public often have, to offer several images so that people can question images made of Viking age (or any certain history), and to enthuse people for historical crafts. Idea is to educate with the help of living history and experiments and to research. The basic information for the houses, tools and artefacts comes both from individual excavations as well as general information. There were no archaeologists involved at the start but by now, some archaeologists are involved as tour guides, developer of historical programs and in the foundation board. The museum consists of a house, storage and smithy. The Vikingabyn is scene for experiments, but seldom in long-term projects. There have been many experiments over the years, but less documented than wished for. These experiments were on iron melting, bronze and silver casting, building techniques, glass-bead making, fermented bred in clay oven, ceramics et cetera. Some crafts have been tried for years and perfected by certain people. 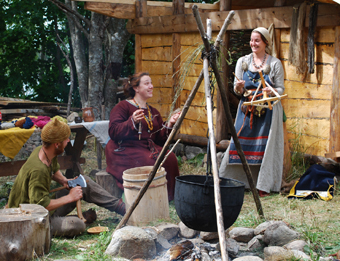 It are people from the support club of Storholmen often together with an archaeologist from the foundation that perform this experiments and crafts. Head of the foundation and head of the Museum since 1996. Member of the Board of NOOAM (Nordiska föreningen för Arkeologiska Friluftsmuseer).